Since its founding in 2013 the Olmsted Tree Society has been an invaluable asset to the Emerald Necklace Conservancy by funding, as its first step, a conditions assessment and management plan of the trees and woodlands in the Emerald Necklace park system and mapping of the heritage trees (48” diameter or greater). 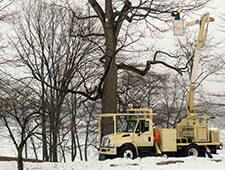 The Olmsted Tree Management Plan, the Party in the Park’s 10th Anniversary Project, guides tree work done in the parks by the Conservancy in collaboration with its public partners. 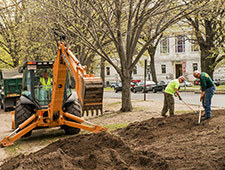 The plan assesses the condition of 7,000 trees in the parks and parkways and assists the Emerald Necklace Conservancy, Boston Park and Recreation, Brookline Parks and Open Space and the Massachusetts Department of Conservation and Recreation in their funded initiatives to preserve and protect our trees. 2017 Projects: Focus on heritage trees (48” diameter or greater) including updated survey report and ongoing tree work in Franklin and Olmsted Parks and the Back Bay Fens. 2016 Projects: Tree and woodland work in Olmsted Park, planting of 150 trees along the parkways, extensive pruning in Franklin Park and soil remediation along the parkways. 2015 Projects: Safety tree pruning, comprehensive tree and woodland work in Olmsted Park, and soil remediation, shrub and tree planting on The Fenway, Back Bay Fens. 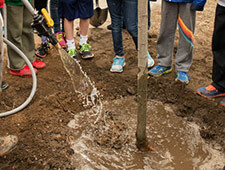 2014 Projects: Ongoing watering for newly planted trees to ensure a vibrant, growing tree canopy. 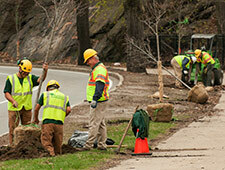 Work continues in Olmsted Park and pruning above the pathway around Jamaica Pond. 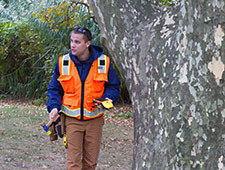 2013 Projects: Creation of the Emerald Necklace Tree Management Program to map and assess trees in the Emerald Necklace parks and parkways. The report was completed and is used as the guideline for tree work in the parks. 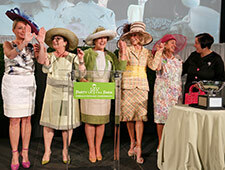 2013 Luncheon: Founding of the Olmsted Tree Society as the 10th Anniversary project of Party in the Park. An enthusiastic crowd participated in a lively “paddles up” auction at the annual Luncheon raising $1M to launch the Fund. Find out how you can become involved in preserving and protecting the trees in the Emerald Necklace by attending the Party in the Park Luncheon and/or adopting a tree. For more information about adopting a tree, please visit the OTS Sponsorship page or contact Veronika Trufanova, Director of Development, 617-522-2700. Activities of the Olmsted Tree Society will be managed by the Emerald Necklace Conservancy in concert with Boston Parks & Recreation, Massachusetts Department of Conservation and Recreation and Brookline Parks and Open Space.